Several years ago when Bolt was still offering classes in the store, I took three flat-pattern drafting classes here. Regretfully, I didn’t follow through much at the time and use what I learned to make that perfectly-fitting wardrobe for myself. But I remembered just enough to create a nice basic bodice sloper using a combination of existing patterns; along the way moving the bust darts, adding (and then removing) darts in the back, changing the curve of the side seams, drawing a shirt-tail hem at the bottom, etc. What I forgot I re-taught myelf with books. Three that we carry in the store which I have found helpful are: Sew U by Wendy Mullin, Design it yourself Clothes, by Cal Patch and Pattern Making for a Perfect Fit by Steffani Lincecum. I am most often inspired by fabric, rather than design/construction, thus my garment sewing tends to be very simple, letting the beautiful fabric do the talking. This little top is a good example. 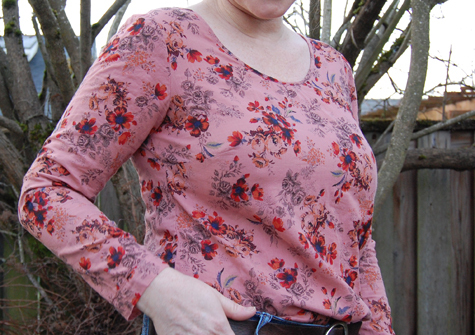 It’s nothing fancy at all save for the gorgeous lightweight floral cotton. It’s basically a long-sleeved woven tee. I have made so many tanks using my basic pattern, but this go-around, I drafted my own sleeve pattern. Needs a lot of tweaking but not too bad for a first try. When you have a basic bodice pattern that fits well you can do a lot with it. 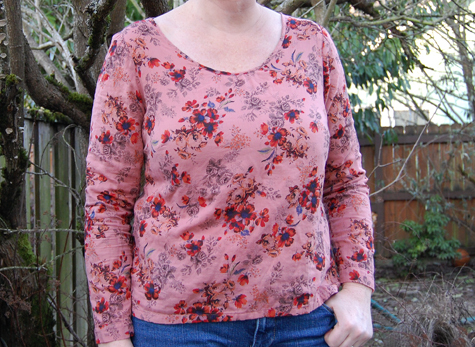 I am planning to add a front placket to my next top. Maybe a pleat in the back. All three of the books I mentioned above have clear information on how to change up pattern blocks so you can make a variety of cute styles for your wardrobe. Go ahead and give it a try. It’s not all that scary once you get started. And if you’re not quite ready to dive in on your own, you can learn how to draft patterns in a class at Modern Domestic or Portland Sewing. Just in: hemp blends, knits, Birch Fabrics, and Flickr Inspiration...get ready!